The Shadow of the Tudor Rose has won two medals in this year's CHILDREN'S LITERARY CLASSICS BOOK AWARDS - Gold for best Historical Children's Fiction and Silver in the Educational category. The Shadow of the Two Princes was a finalist in this year's International Rubery Book Awards, being shortlisted in the top 5 Children's and Young Adult Fiction category. 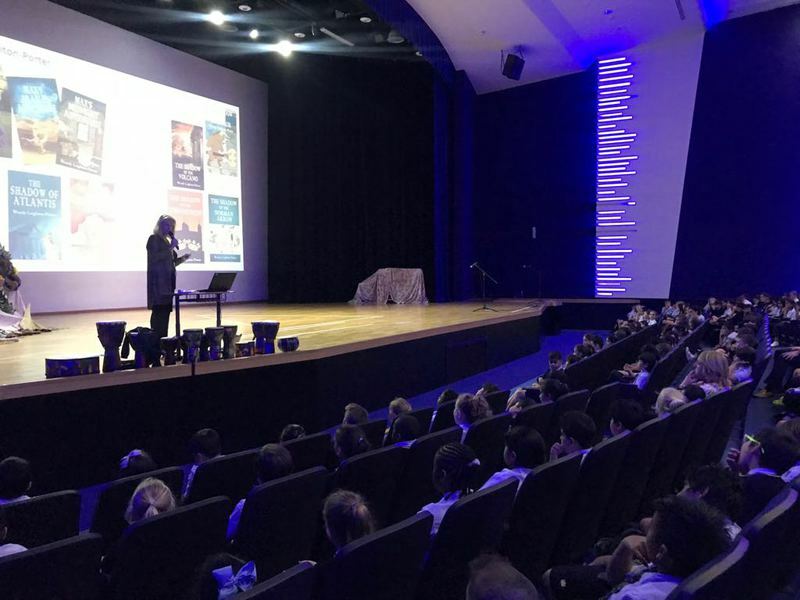 Many thanks to Amity International School Abu Dhabi for inviting me to visit them at the start of their World Book Week celebrations. 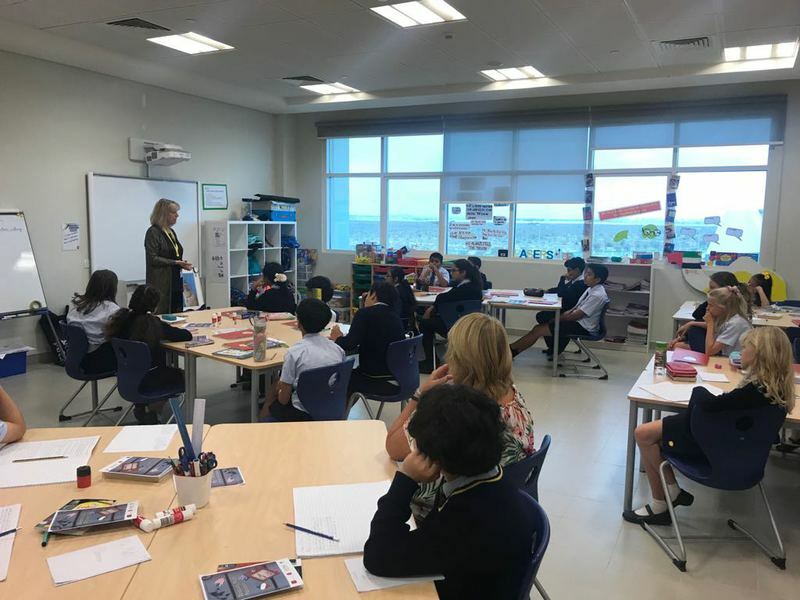 I spent a wonderful day with Years 4-6, hearing all about their work on Greek Myths, and sharing The Shadow of the Minotaur and The Shadow of the Trojan Horse with them. The young students I met are a real credit to their school and I was honoured to spend some time with them. Max's Hallowe'en Adventure is now available on Kindle and in paperback from Amazon. The Shadow of Atlantis, The Shadow of the Minotaur and The Shadow of the Pyramid have won FINALIST places in the READERS' FAVORITE BOOK AWARDS 2017. I HAVE BEEN AWARDED TWO GOLD MEDALS IN THE CHILDREN'S LITERARY CLASSICS BOOK AWARDS! Shadows from the Past won Best Middle Grade Series and Max's Christmas Adventure won Best Holiday Book. I'm feeling very proud right now! "Tradition continues with the arrival of one of the most anticipated moments in the world of children’s and young adult literature. The 2017 Literary Classics Book Award Finalists and Top Honors Book Awards Finalists have been announced.These distinguished honorees are recognized for their contributions to the craft of writing, illustrating, and publishing exceptional literature for a youth audience. In this highly competitive industry these books represent the foremost in literature in their respective categories. The competition this year was tremendous, and we congratulate all of the finalists for their outstanding and inspiring work. Final awards, categories and levels will be announced on July 1, 2017. All Silver, Gold and Top Honors award recipients will be invited to attend a writers’ conference, awards ceremony, formal gala, and authors’ book signing. The Literary Classics selection committee is proud to recognize this year’s titles in literature which exemplify the criteria set forth by the Literary Classics award selection committee." Check out Max's very own Fan Page on FACEBOOK. He'd love you to pay him a visit there and leave him a "like"! Max's Arabian Adventure has shot straight to the Number 1 slot on Amazon's bestseller list for Folk Tales & Myths. Well done, Max! So, having said yes to donating a story, I wondered what I should write. The answer came almost at once. How could I possibly write something which didn’t include my favourite hero? Surely the handsome and adorable Max, my wonderful talking Tonkinese cat, was just crying out to set off on another trip into the past. Actually he wasn’t keen at all – those of you who are already familiar with my Shadows from the Past series will know that Max is a rather unwilling participant in these adventures, not being the bravest of cats, and the idea of a solo mission was even scarier than usual, but my mind was made up. The result was Max's Arabian Adventure. Look out for it NOW on Kindle and also as a small paperback! Many thanks to the 1,550 people who downloaded Kindle copies of my books over the Christmas period. Happy New Year to you all and happy reading! Max is a NUMBER ONE Best-selling Cat! In September The Shadow of the Volcano reached the NUMBER ONE slot in the Kindle rankings for children's historical fiction on both Amazon.com and Amazon.co.uk Hurrah! Today is August 14th, which is a very special day, for it is none other than Max's birthday ... and how appropriate that he was born under the star sign of Leo, the lion! Happy birthday, Max! In July The Shadow of the Trojan Horse made it to the NUMBER ONE slot in the ranking for children's Kindle books on Amazon.com! That makes it a NUMBER 1 bestseller - hurrah! The latest book in the series, The Shadow of Camelot, is now available on Kindle and as a paperback from Amazon. If you like Arthurian legend, then I'm sure you'll enjoy Max's new adventure! On July 23rd it reached Number 7 in the Amazon.com bestseller chart for Children's Action & Adventure ebooks! Now who is this handsome boy? And what on earth is he wearing?! At the end of May 2013, The Shadow of Atlantis reached number 8 in the Amazon.co.uk list of children's action/adventure ebooks (and number 12 on Amazon.com)! 939 people downloaded the Kindle version of The Shadow of Atlantis from Amazon between 6th-8th March. Thank you to everyone who did, and I hope you enjoy reading it! A huge thank you to Elmbridge Junior School in Gloucester, and particularly to Years 4 and 5, as well as their teacher Mrs Reedman - I received such a warm welcome from them all today (Wednesday 6th February) and spent a thoroughly enjoyable afternoon in their company. 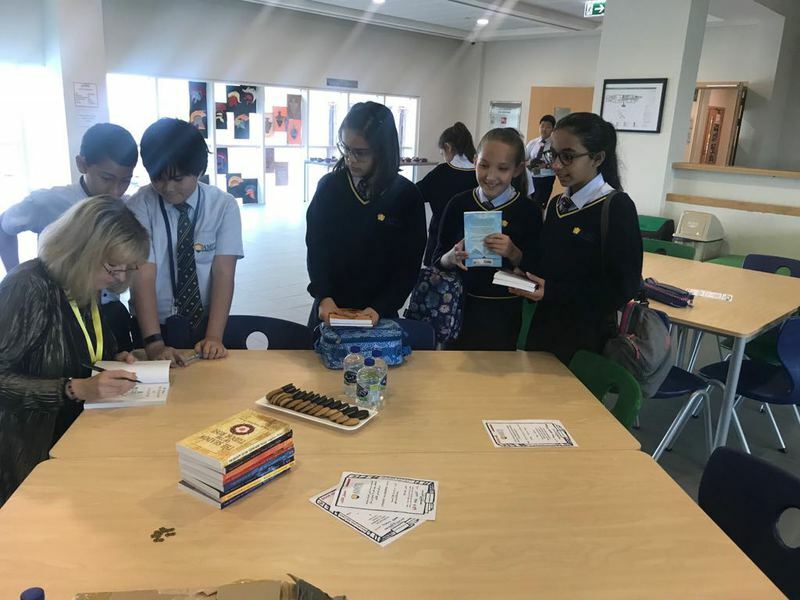 The pupils are reading The Shadow of Atlantis at the moment and were keen to ask me all sorts of interesting questions about my books ... and, of course, about Max! I do hope they'll invite me back again soon. Thank you, years 4 and 5 at Elmbridge School, for the lovely card which I've just received from you in today's post. Max loves the drawing of him signing books! Thanks to the amazing Berni Stevens for all her beautiful cover designs. Everyone says how eye-catching and attractive they are! "I do have to comment on the cover image as well as ALL of the covers in the SHADOWS FROM THE PAST series. They are so beautiful and eye-catching! I just love them and I’m immediately drawn to the book because of the covers. So, I don’t normally do this, but I do want to give a shout-out to Berni Stevens who designed all of the book covers in the series. Check out her website www.bernistevensdesign.com." Thank you to my friend Clare, for her wonderful drawings of Max - they are brilliant! Many thanks to King's School, Gloucester, for inviting me in to do an Author's visit on Friday November 9th. I had a wonderful time and I'd particularly like to thank all the First Form who attended the sessions. I was extremely impressed by their knowledge of Greek myths and legends and thought they asked some really thought-provoking questions. I shall look forward to going there again in the New Year.